A few months ago, I was asked to create some name cards for a small, summer wedding. The special couple didn’t have an idea for their wedding favors yet, so I figured we would kill two birds with one stone (which, by the way, is a horrible saying in my opinion. There’s gotta be something better like “Pet two puppies with one hand”? We will go with that!) and create some keepsakes that would fill the role of wedding favors and name cards. 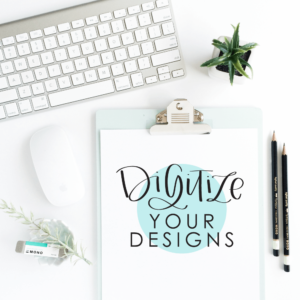 After a deep dive on Pinterest, I found the perfect inspiration – bookmarks! The couple and their families are avid readers, so it was a great fit. 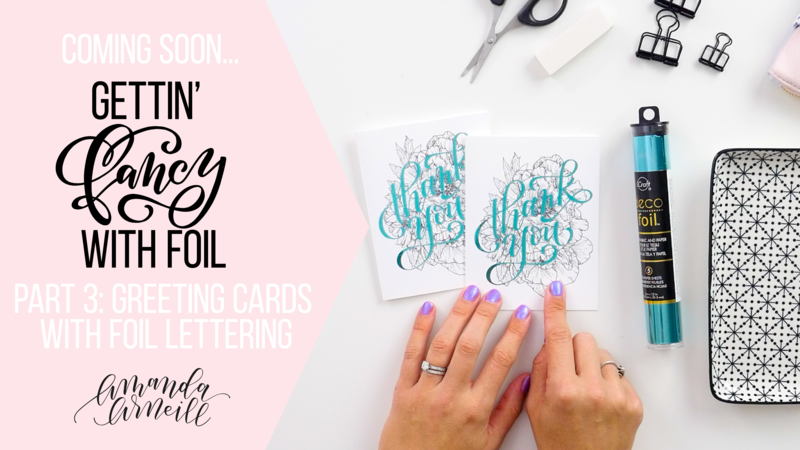 And we know from Part 1 of our “Gettin’ Fancy with Foil” series, that I will take any excuse to break out my Minc machine and add some foil to my projects. So, we moved forward with creating hand lettered foil bookmarks, personalized with the guests’ names on one side, and a special message from the bride and groom on the other. 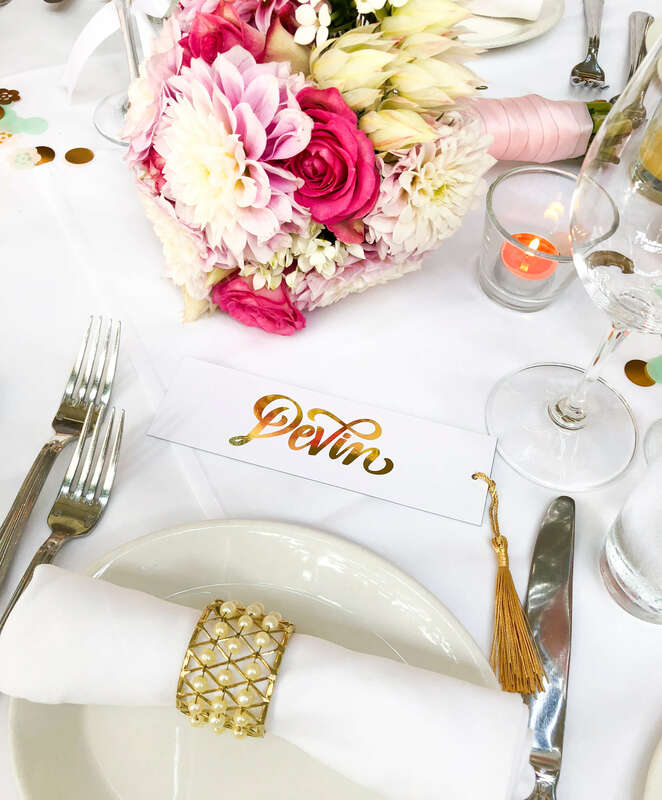 The bookmarks were a hit and were a great addition to the already gorgeous wedding decor. Unlike most wedding favors, not a single one was left behind at the end of the night. My girls watched me make these bookmarks and pleaded with me to make them their own. 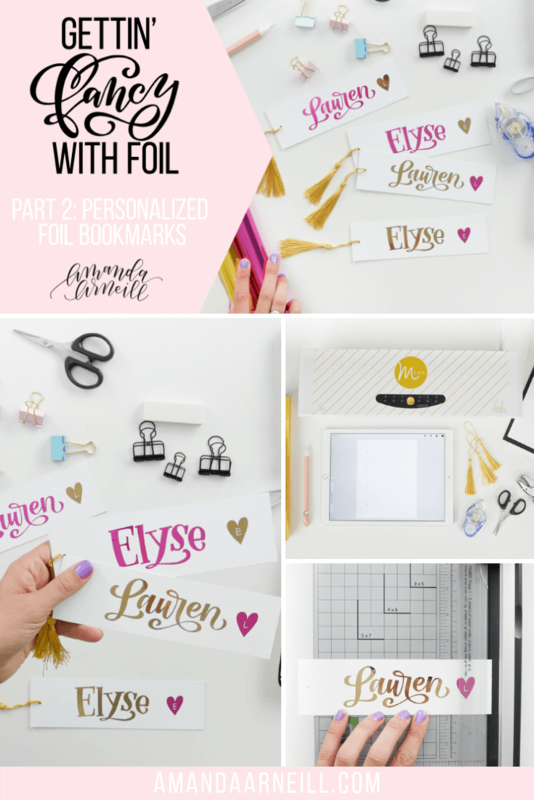 I already knew that I wanted to share this hand lettered foil project with you, so I figured that we would pet two puppies with one hand and make a tutorial for you so that you can make your own bookmarks, creating my daughters’ bookmarks as an example. This also gave me a great excuse to use some of the approximately 100 tassels that I’m now the proud owner of. 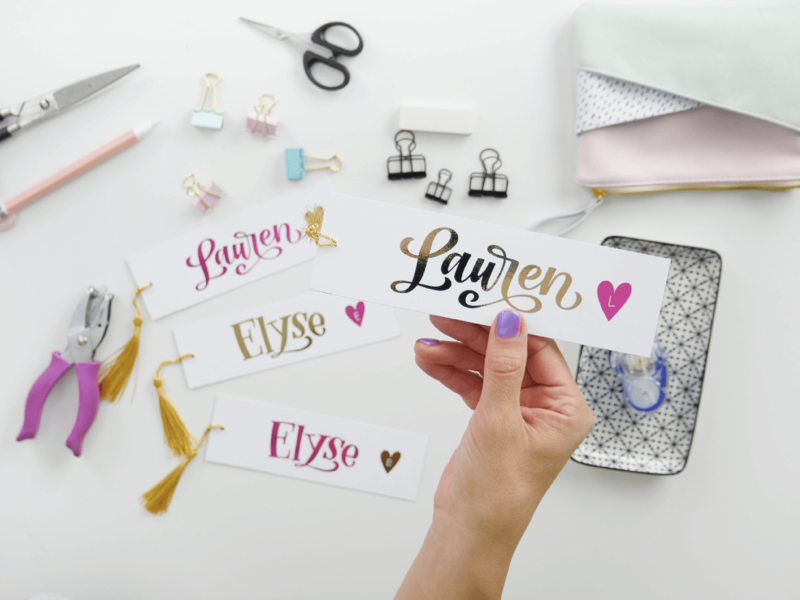 These bookmarks are perfect for any occasion – weddings, birthdays, classroom gifts, holidays, or just because! Join me for Part 2 of our 4-Part “Gettin’ Fancy with Foil” video lesson series (If you missed Part 1 – just click here to watch that now!) 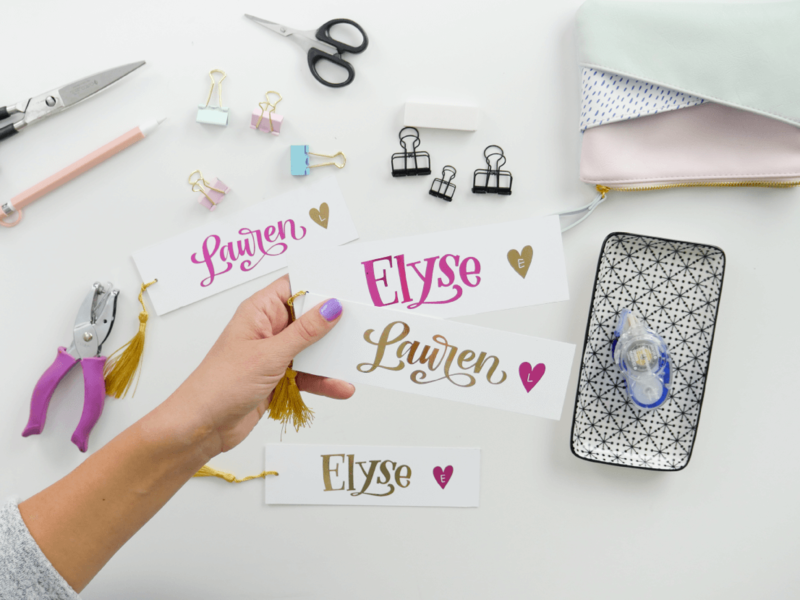 and learn how to create your own set of special, personalized foil bookmarks. 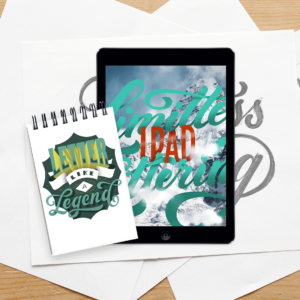 Just scroll down to watch the video tutorial, find the fully linked supply list and download the Procreate compatible bookmark template on to your iPad. 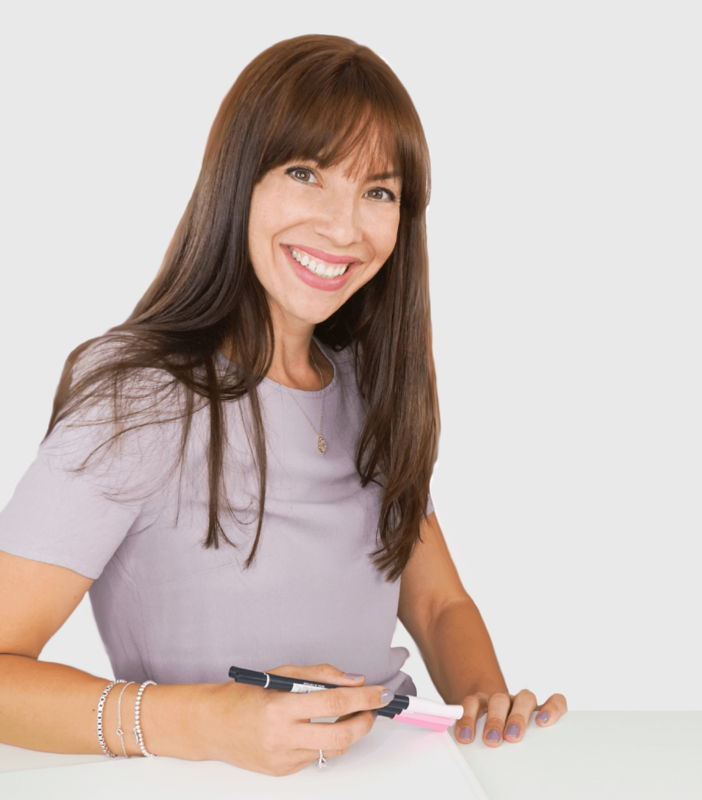 Trim approximately 1/8 inch off of each side of your bookmark, to create a crisp, sandwich edge. 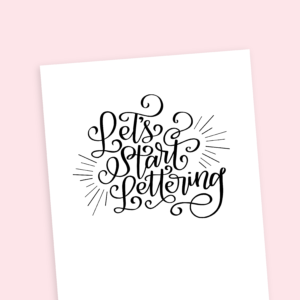 Join me next “Foil Friday” when the next hand lettered foil project that we will be creating together is foiled greeting cards. See you then!